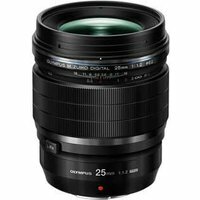 Incorporating the latest optical technology to deliver edge-to-edge resolution results, the Olympus 25mm f/1.2 M.Zuiko PRO Lens features exceptional low-light capabilities with unrivalled sharpness and clarity. Splash-, dust-, and freezeproof, this rugged lens produces images with stunning bokeh due to its fast f/1.2 aperture construction. Furthermore, it boasts a super-fast autofocus system.